There are more habitable planets in our galaxy than humans living on planet Earth. But the nearest one is about 70 trillion miles away, which means that, for now, and for the foreseeable future, Earth is the only life-supporting rock hurtling through infinite space we’ll ever know. It’s really not the best idea to let it burn up–and key to keeping it cool are the massive rainforests of the Amazon. Sadly, we’ve had a hard time not cutting them down. A new project should help prevent–or at least slow down–that hot future. If all goes to plan over the next six years, a project led by Conservation International will become the largest tropical reforestation project in history. Seventy-three million trees will sprout up across what’s known as the “arc of deforestation,” in the Brazilian states of Amazonas, Acre, Pará, Rondônia, and throughout the Xingu watershed. The short-term plan is to restore 70,000 acres (the area of 30,000 soccer fields) that have been cleared for pastureland to their former forested glory. He’s right: Simply stopping deforestation could allow existing forests to absorb up to 37% of our annual carbon emissions; replenishing degraded areas could do significantly more for the planet. 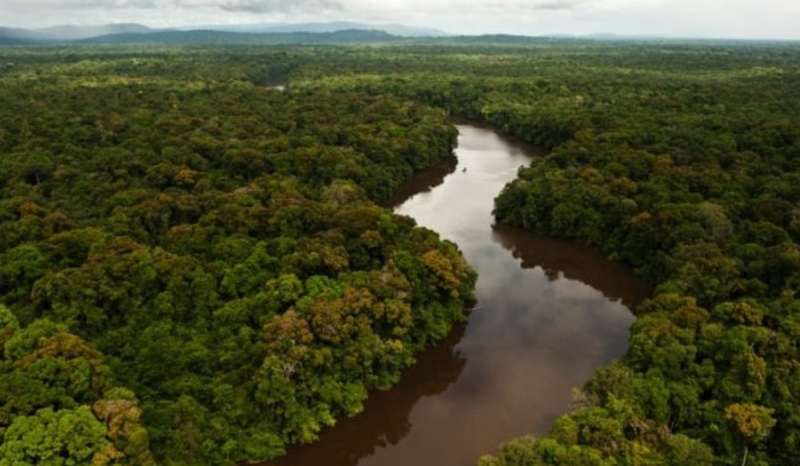 Over the past 40 years, about 20% of the Amazon has been cut down or destroyed, and scientists worry that another 20% of the rainforest will be lost in the next couple of decades. So, instead of following precedent and planting saplings, which are labor and resource intensive to manage (and, depending on the selected species, may not be best-suited for the territory, resulting in less than ideal survival rates), the organizing coalition is trying something different. Developed in Brazil only a few years ago, the new planting technique is called muvuca. “In Portuguese, it means a lot of people in a very small place,” says Rodrigo Medeiros, Conservation International’s vice president of the Brazil program and the lead on the ground. The muvuca strategy demands that seeds from more than 200 native forest species are spread over every square meter of burnt and mismanaged land. The seeds are purchased from the Xingu Seed Network, which since 2007 has acted as a native seed supply for more than 30 organizations, thanks a collection of more than 400 seed collectors–many of whom are indigenous women and local youths. Of course, even in nitrogen- and phosphorus-rich soil, only some of these seeds will survive–but that bit of natural selection is key to the muvuca magic. Several seeds germinate, compete between themselves for nutrients and sunlight, and the strongest ultimately become big trees. According to a 2014 study by the Food and Agriculture Organization and Bioversity International, more than 90% of native tree species planted with this strategy germinate, and they’re especially resilient, able to survive drought conditions for up to six months without irrigation. Working alongside Conservation International are the Brazilian Ministry of Environment, the Global Environment Facility (GEF), the World Bank, the Brazilian Biodiversity Fund (Funbio), and Rock in Rio’s environmental arm “Amazonia Live.” While this coalition provides the high-level leadership, it’s actually indigenous communities and small family farmers who have ownership of this project. In any given hectare, as many as 2,000 locals will be actively working together to reforest the land–typically private farmland but also government-owned protected zones and indigenous territories. Pay is issued evenly among participants, and families can earn about $700 per hectare reforested. The finances are typically managed by a local NGO in the field, with support from project sponsors. Already a couple million trees have been planted, and it’s a win-win situation for all involved parties, says Medeiros. The coalition gets labor at a fair price. Indigenous communities can maintain their livelihoods and get recognition as the rightful owners of rainforest land. And farmers sign partnership agreements to fast-track recovery on their own land with logistical support. “Springs, rivers, and streams that were suffering from the lack of water are already beginning to show signs of recovery in the region,” says Medeiros, which has led to more productive soil and better yields for farmers, too. There’s more good news, as we’ve previously covered: Despite the reality that millions of acres of rainforest are still disappearing, there are now more trees and other vegetation on the planet than there were in 2003. This project will help Brazil move toward its Paris Agreement target of reforesting 12 million hectares of land by 2030, and may prove key in restoring much of what’s been lost in our lifetime.